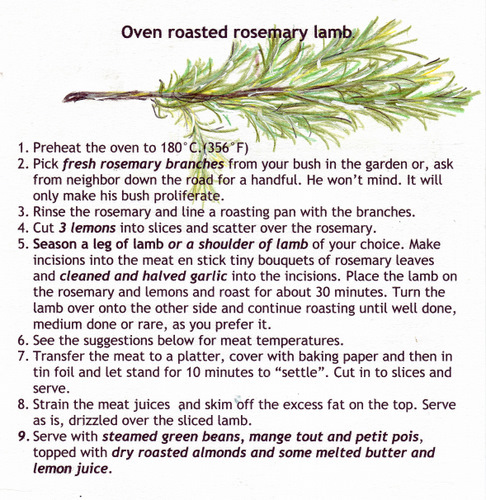 Oven roasted rosemary lamb…and an ode to the rosemary. Rosemary and lamb. A perfect combination. 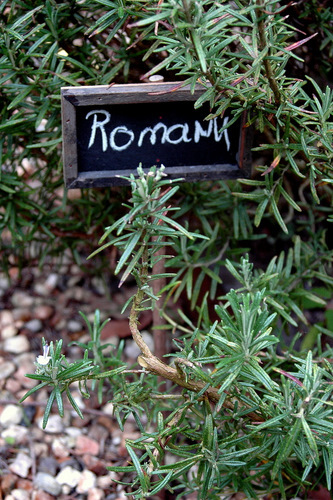 Other/or mixture of herbs can be used along with rosemary. Rinse them and use them wet to line your oven pan. 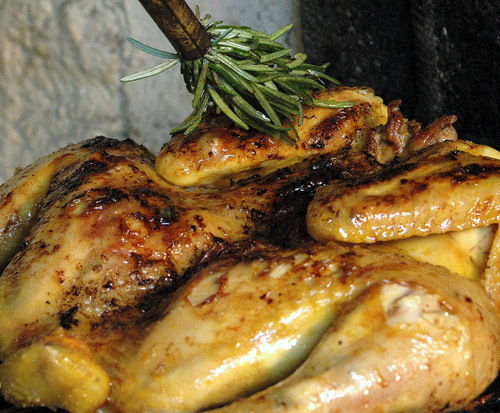 Chicken and pork can be used the same way, cut off excess from pork. It is worth it to invest in a meat thermometer. It gives you your desired stage of cooking and keeps the guessing and disappointment out of oven roasted pieces. A piece of meat does shrink alot when roasted at high temperature. But it is still tender and juicy. If you want less shrinkage, bake for longer at 150-160 °C. “You smell like rosemary“, said our daughter when she hugged me at the train station. I bloomed. I liked the thought of smelling like rosemary. It says…mother. Care . Childhood. Home. Remembrance. “My mother was cook in the kitchen. My father was cook at the barbecue. And between them grew a rosemary bush. I have my own rosemary bush now and when I walk past it and feel my legs brushing the leaves, a heady fragrance envelops me making me feel lightheaded with memories. 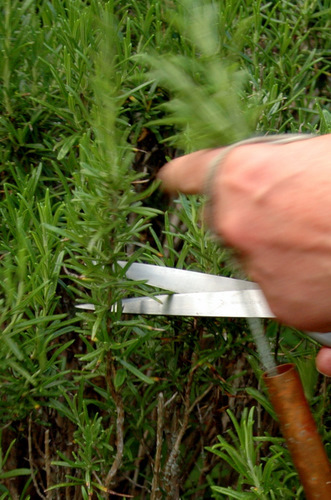 I smell my mother after her fiddling in the garden among her roses and herbs and I see my father bending over the rosemary bush, cutting and snipping leaves for his lamb cutlets. Our mealtimes were festively spent around a table in the garden, or in the summer kitchen by die barbecue or under the walnut tree overlooking hills or elegantly candle lit in the dining room or simple and homey around the kitchen table. I recall hours of inventing new recipes, cooking and preparing, tasting wines, all the while eating at pretty set tables around laughter and jokes, teasing and chatting and many a times heart-to-heart talks. I have no doubt, that there where they are now, they still reign as queen of the kitchen and king of the barbecue. 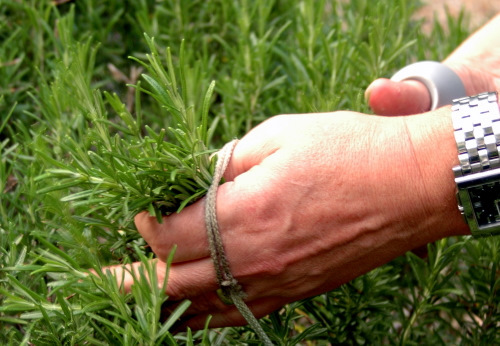 And between them, a rosemary bush grows high and lush”. OMG, I love lamb and rosemary! that looks so mouthwatering. Have you tried adding lavender? Rosemarry brush! oh that’s an idea! 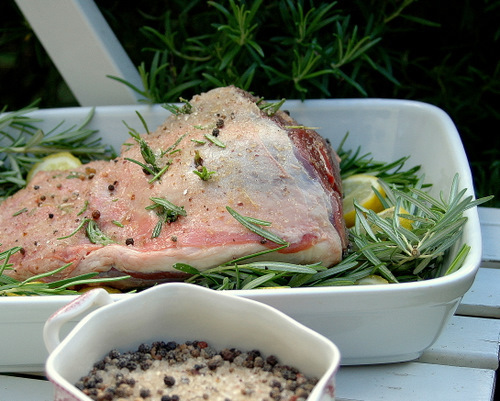 I love the idea of basting with a rosemary brush, and your lamb looks fantastic. Amazing, I love the rosemary brush! You and Jeanne are on the same wave length with the roast lamb!! I’ve never much liked lamb but this! 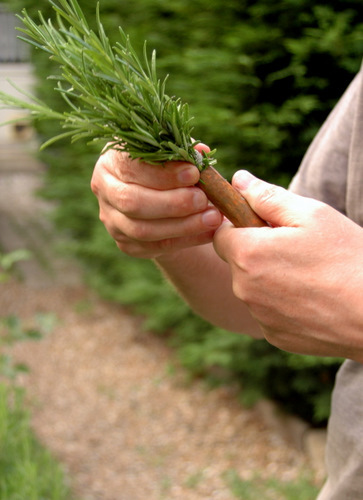 oh my, I’ll have to give it a try… and make a rosemary brush. What a clever idea. Sometimes I think about how I want my children to remember me, too. Your tale of mom and dad in the kitchen/garden is wonderful and I’m sure that’s exactly THE memory. And you’re leaving some wonderful paintings, too. I am all smiles – smiles of rosemary. Today, I smell of basil – tomorrow who knows? 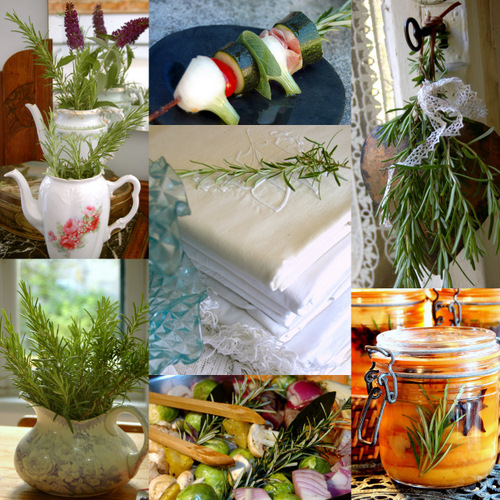 I do love to keep sprigs of rosemary in vases on the table. Remembrances. The lamb is succulent and my favorite way to prepare it. All so summer-rosemary lovely. An ode to rosemary! 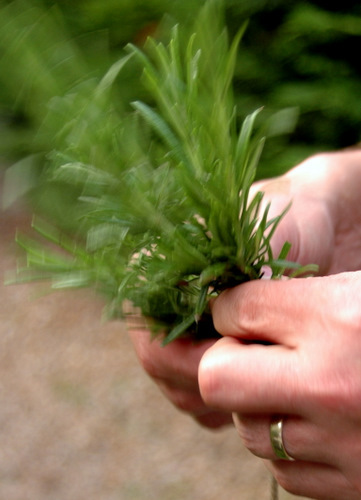 Rosemary is very special and enhances the robust. beautiful images, i can taste the lamb! What a wonderful post Ronell – poetic and yet you had me salivating from the ‘get go’! Feels to me I know exactly where that rosemary bush is growing since looking at your garden through Ingrid’s camera lens. I love the idea of basting with a ‘rosemaria’ brush. 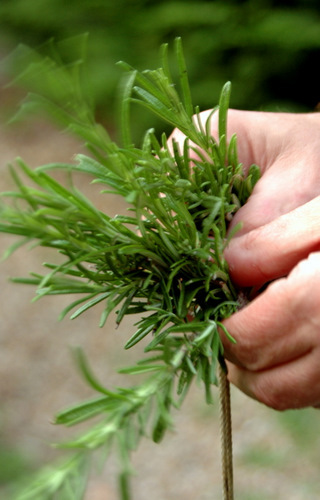 When living in Spain I often picked some fresh wild rosemary twigs for a rosemary shortbread recipe I use from a book called “Recipes from my French Herb Garden”. I haven’t had too much success with growing it in a container hence the country trips. But I loved doing it, felt like claiming a long lost ‘missing part’ of me back. Love your blog!! 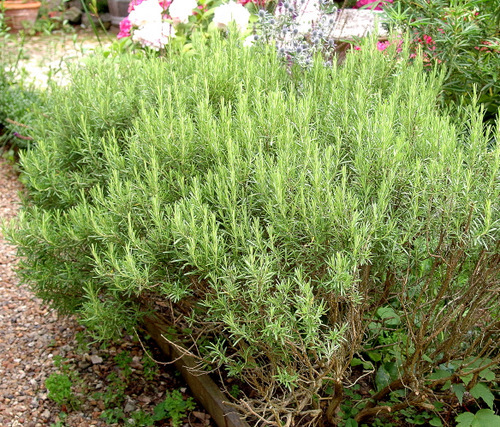 And I’m embarrassed to say that I had no idea rosemary could turn into a big bushel like that-wonderful that is. Maybe I should plant some for my Mom. I planted organic oregano to protect her vegetables along with onions (also for protection). The oregano is growing wonderfully. I wonder if rosemary does well in environments where oregano does?? Anyway, this sounds delicious. When I eat meat, lamb is what I love. And your’e right-rosemary and lamb are a perfect combination-nice! Thank you everybody for the kinds visits and comments. 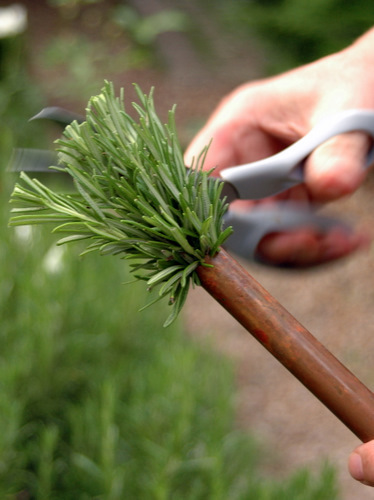 *Stella*…rosemary is very forgiving and will grow best in warm and dry areas…you can just leave it be..it will do fine all on its own. Which explains why they grow so abundantly in the wild in the Mediterranean. And that is why *Carina*(who commented above) can go and pick to her hearts delight! I think that is wonderful…taking your little basket and go pick wild rosemary(and thyme) while you just relax in nature! If I had wild rosemary and thyme so close to me…I would be out there more often..
What a lovely piece of lamb!! That oven roasted rosemary lamb is a classic,..But I love my classics too!! I had hoped for, I truly wish to enjoy it in my home. Thank you so much!!! I hope I’m not too late!!! I love your preference for how you want to be remembered. And I love South African men – that brush that H made looks just like something Nick would make 😉 Nothing better than roast lamb with rosemary!